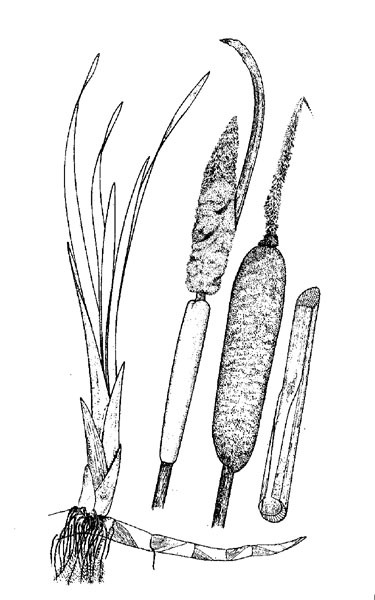 Typha domingensis, Typha orientalis, Typha latifolia. 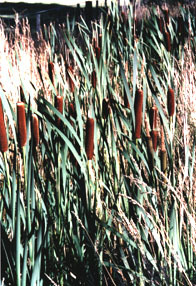 Growth Habit: Cumbungi are tall, reed-like, aquatic plants that have an extensive creeping root system below the water. The long strap like leaves and seed heads can grow to 2 metres high. Type of Plant: Semi-aquatic, perennial herb. Flowers: The flowers of the Cumbungi are extremely small and hundreds of thousands of them are organised into cylindrical heads on the flowering spikes, commonly called bull rushes. Fruit/Seed: Small spindle shaped seeds. Seed production has been estimated to be as high as 17 million seeds per square metre of infestation depending on the type of Cumbungi species. Dispersal: The spreading root system of the Cumbungi increase the size of existing colonies each year. The seed has a feathery attachment which helps it to be carried by the wind and float on the water to new sites. The seed is also carried to new places on the feet of animals and birds, and on earth moving or agricultural equipment. Distribution: There are two native types of Cumbungi; the Narrow Leafed Cumbungi (T. domingensis) and the Broad Leafed Cumbungi (T. orientalis) and one introduced species Cumbungi (T. latifolia). Status: Cumbungi is a Declared Noxious Weed in some parts of New South Wales and a Declared Secondary Weed in Tasmania. As Cumbungi is part of the natural ecosystem in Tasmania and as it is widely distributed throughout the state, aiming at total eradication is both undesirable and impractical. It needs to be controlled in situations where it is causing problems. Early Tasmanian literature suggests that Cumbungi was a lot rarer in the past than it is now. Severe droughts in 1967-68 lead to an increase in the number of farm dams and irrigation systems, areas ideal for colonisation by Cumbungi. Run-off from paddocks that contain stock manure and/or excess fertiliser has increased the chances that Cumbungi will become established. Cumbungi can rapidly spread throughout a dam or irrigation channel, restricting the water flow, increasing the rate of siltation and by altering the water flows actually increasing the risk of flooding and erosion. Because of the large amounts of organic matter produced it can cause problems with water pollution when the leaves die off and start to decompose. Cumbungi can over a period of time greatly decrease the amount of water being stored in farm dams and increase the amount of maintenance necessary. Although considered to be an aquatic weed, Cumbungi has recently established itself along roadsides in table drains that do not have permanent water. This has lead to an increase in the amount and cost of routine maintenance of these drains. As a natural part of the Australian wetlands, stands of Cumbungi provide cover, food nesting places for water birds and other native animals as well as habitats for aquatic insects, native fishes, freshwater invertebrates (yabbies etc.) and frogs. The plant protects the sides of creeks, lakes and ponds from erosion. The prolific growth provides a natural mulch for adjoining foreshores. Grubbing (summer, spring and autumn). Best with small plants- ensure all roots are removed. Excavation (all year). Mechanical removal of larger infestations is advisable to minimise the chance of herbicides entering waterways. Ensure excavated material is disposed away from dam so it can dry out and die. Grubbing will be a necessary follow up as mechanical excavation may not remove all roots and rhizomes. Cultivation (summer, spring and autumn). For small infestations with low water levels, this method can be effective. Cutting (January and every 4 – 6 weeks following). When the plant is well advanced with flowering (Dec to Feb) cut the plant 50-150mm under the water starving the plant of oxygen. Repeat every 4-6 weeks until winter. Repeat process in coming years as required. Spraying (Late December – February). Apply a herbicide registered for use in waterways in period between male flowers opening and 6 weeks after female flowers open (usually December- February). Avoid run off or spray drift entering water. Wiping (December – February). Using a wiper minimises the risk of run-off and spray drift and applies an even amount of chemical on the target plant. Check with DPIWE for information on herbicides appropriate for this method.